Fernos Fente, shown with her daughter, was near death when she entered Ethiopia’s Dangila Hospital in 2016. A surgical team performed the emergency caesarean section that saved her and her baby. The team is among the Ethiopian health workers who are benefiting from the Jhpiego-led Safe Surgery 2020 initiative supported by the Ministry of Health and the GE Foundation. (Photo by Charles Wanga/Jhpiego). Dangila, Ethiopia – Fernos Fente was in labor and in need of simultaneous surgeries—a highly unusual and highly risky scenario—when she was referred to Dangila Primary Hospital in northwest Ethiopia. She needed both a cesarean section and removal of a portion of the intestine due to a gangrenous blockage. Not that long ago, Fente and her baby likely would have died. When the health center was upgraded to a primary hospital in 2015, its staff lacked the skills to confidently diagnose and treat cases like Fente’s, and the facility lacked necessary equipment such as X-ray and ultrasound machines. 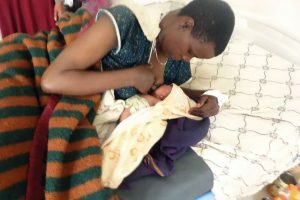 The Safe Surgery 2020 (SS2020) Initiative implemented in June 2016 made all the difference to Fente and her baby. 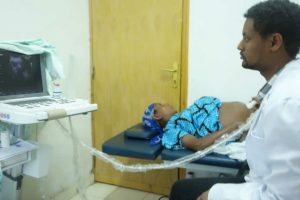 “We used to have difficulty in confirming [pregnancy-related] conditions that required immediate interventions,” said midwife Medhanit Mulugeta. She and 67 other staff at the hospital—including Amsalu Tiruneh, Fente’s emergency surgical officer—routinely fielded negative feedback from patients who weren’t satisfied with accessibility, affordability and quality of care. The government’s hope was for Dangila to serve rural Ethiopia, where more than a million people couldn’t easily reach any hospital that offered surgery. But the staff quickly realized that easy access to the hospital wasn’t enough to persuade nearby residents to come to the hospital for services. Serious challenges to offering high-quality health services needed to be overcome, and improving surgical care was the top priority, hospital leaders decided. Through the SS2020 Initiative, a core group of hospital staff, including Tiruneh, began learning how to improve surgical services at Dangila. SS2020 Initiative is a multi-stakeholder partnership funded by the GE Foundation; Jhpiego is a lead partner working in Ethiopia, Tanzania and Cambodia to strengthen surgical services and access to basic surgical care for women and families. In collaboration with the government of Ethiopia, the SS2020 Initiative seeks to motivate and guide hospital staff in how to identify problems, innovate solutions and lead the efforts that will result in improvements. This system-wide approach focuses on the process of delivering high-quality surgical care across a broad range of procedures, regardless of a facility’s size, location or age. The training supports Ethiopia’s national Saving Lives through Safe Surgery (SaLTS) program. As the first national surgical plan to be implemented globally, SaLTS aims to make surgical care available and accessible through holistic quality improvements at the facility level. Jhpiego’s focus is the key pillar of leadership development, where staff at a local hospital develop the skills to identify goals, establish strategies and implement lasting change for improved patient outcomes. Emergency clinical officer Amsalu Tiruneh (left) and Dr. Zebenay Bitew are part of a team-approach to improving surgical services. Through SS2020, the Dangila team participated in leadership training that emphasized problem-solving and management skills. 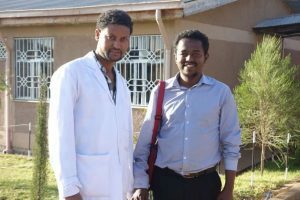 Supported by the Amhara Regional Health Bureau and the Surgical Society of Ethiopia, the training recasts challenges as opportunities for improvement. It also empowers staff to be entrepreneurs and innovators who drive change to strengthen skills and improve health services. The Dangila team returned from the Safe Surgery training in June invigorated and ready to make improvements. In just 5 months, the hospital’s surgical team improved their practice and operations, leading to lifesaving gains in surgical care. Importantly, Dangila convened a SaLTS committee, charging members with coordinating and enacting an overall surgical improvement plan. In addition to allocating resources for purchasing or borrowing needed equipment, the committee mobilized the community to donate more than $13,000 toward an ultrasound machine, an essential piece of imaging equipment used to help assess and diagnose internal health problems. Impressed by those efforts and the team’s clear vision to continue to improve, the regional health bureau’s deputy head, Bizuayehu Gashaw, helped Dangila to properly install an X-ray machine. With new resources and support, Dangila’s emergency surgical officers focused on gaining the skills to confidently diagnose and manage surgical cases—a vital step for a hospital staff lacking a senior general surgeon. The officers attended surgeries in pairs, alternating as surgeon and assistant to share ideas and experiences, ultimately gaining confidence while reducing duration of surgeries and referrals to other hospitals. The surgical team held daily meetings to review every surgical case, identifying and solving challenges, and incorporating new practices into their routines to better manage the delivery of care – a key outcome of the training. They liaised as needed with the SaLTS committee or conferred by phone with senior surgeon mentors from larger referral hospitals. Finally, with new equipment, skills and a focus on providing high-quality care to every patient, the Dangila team spread the word that they were competent to handle complicated referral cases. They posted announcements throughout the region communicating the types of procedures and services available at their hospital. Emergency surgical officer Tiruneh conducts an ultrasound on a pregnant woman. “What is more interesting than serving and satisfying the community?” Tiruneh asks rhetorically. The SS2020 Initiative underway at Dangila also is being piloted at five other hospitals in the region, with each reporting important gains in surgical capabilities. Plans to extend the leadership training to an even greater number of hospitals in Ethiopia and throughout eastern and southern African mean that more mothers, like Fente, will be thanking local emergency surgical officers and teams for saving their lives and those of their babies. Safe Surgery 2020 is a multi-stakeholder initiative that seeks to improve surgical outcomes in low and middle income countries. It is funded by GE Foundation and in partnership with Assist International, Dalberg, G4 Alliance, the Harvard Program for Global Surgery and Social Change, and Jhpiego. Jhpiego leads the SS2020 leadership program. Teruwork Gultie is a senior operating room nurse and senior program officer in Jhpiego’s Ethiopia office; Abraham Mengistu (MD, MPH) served as the SS2020 project manager; and Alena Skeels is a technical development officer in Jhpiego’s Innovations Unit. Digital media specialist Cole Bingham also contributed to this article.